By the way, we're going widescreen in the main text frame from now on. Welcome to the future! Knowing what I know now about how XBees work, I would say its one failing would be in attempting to stream the note data wirelessly to the controller. For the most part it worked, but it would spontaneously drop notes and had little in the way of error checking to prevent that. But that's more on the parsing, data handling, and communications stack side; the physical method of playing three notes at the same time was relatively simple and worked as expected. Voltage builds up and at some point there is a discharge through the air which creates the sound. 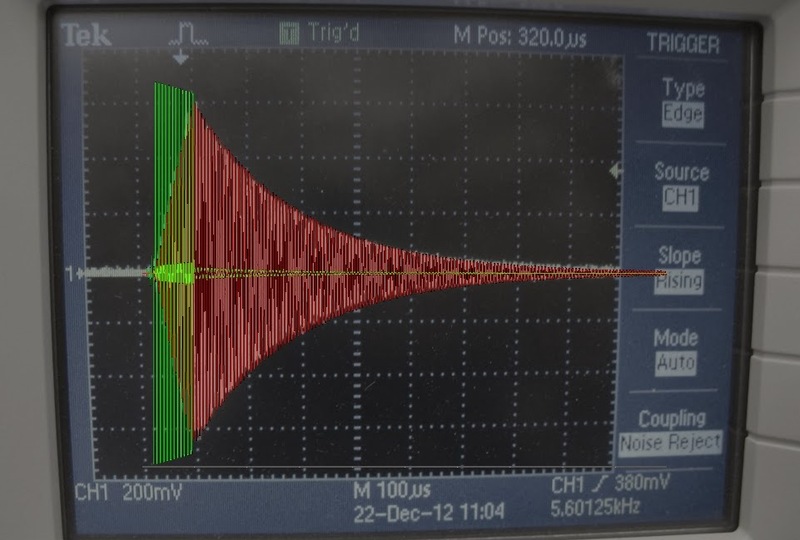 The pulse is very short: on the order of 100μs PWM drive time plus some decay time that depends on a lot of things. The actual sound-producing part of the pulse is probably even shorter - only the very peak of the voltage where an arc is generated. How that pulsed arc is transformed into a sound pressure wave is a bit beyond my ability to simulate. For the purpose of this discussion I just assume that it creates a short square pulse of sound equal to the driving pulse length. If I had to guess, I would say the real thing is more of a triangle, somewhat narrower than the driving pulse width, and centered around the peak voltages where an arc is actually generated. The further you get from the coil, the more it gets spread out, kind-of like thunder but on a much faster time scale. But unless you take it down into a canyon or something, there will be sharp edges on the time scale of the note frequency, giving it the characteristic cracking sound. There is one problem though...overlapping pulses. In the worst-case, if pulses are simply OR-ed, there is the possiblity of N pulse lengths adding together, where N is the number of notes. Since it's a resonant circuit, the resulting long pulse will ring up to much higher voltages and currents than intended, leading to certain destruction. So to ensure this doesn't happen, there is a simple rule to obey: A new pulse cannot start while an earlier pulse is ongoing, or for a certain holdoff period afterward. The holdoff period is to allow for ring-down after the driving waveform has stopped. Driving pulse followed by a possibly exaggerated no-load ring down (red). Even though the statement of this rule is simple, there are many ways to actually implement it. Since I couldn't say for certain which way would most accurately produce the sound of three independent notes played simultaneously, I decided to do what I always do and write a VB program to solve the problem for me. One of the ugliest and most annoying VB programs I have written. Simple Drops: Notes are associated with up-counters that roll over after the note's period has elapsed. A pulse is generated if a note counter rolls over and no other note counter is below the pulse length plus holdoff time. Otherwise, the pulse is partially or completely skipped (dropped). It's a brute force method that I didn't expect to work well but was good for comparative testing. Unlike all the other methods, there is no priority given to lower-number notes. Counter Hold: If a pulse attempts to start during the on time or holdoff period of an earlier pulse, the counter that generates the later pulse is stopped until the end of the earlier holdoff period. After the end of the earlier holdoff period, the counter is restarted and allowed to generate its pulse. If two or more pulses try to start at exactly the same time, a fixed priority is implemented (lower number notes first). Random Phase Shift: If a pulse attempts to start during the on time or holdoff period of an earlier pulse, the counter that generates the later pulse is shifted to a random position outside of the pulse-generating range of that counter and allowed to continue running from there. (Equivalent to inserting a random delay of less than one counter period minus one pulse+holdoff time.) If two or more pulses try to start at exactly the same time, a fixed priority is implemented (lower number notes first). Inspired by packet collision avoidance methods in digital communication: If the channel is not clear, each waiting transmitter can delay a random amount to minimize the chance of getting stuck in a four-way stop sign standoff. ISR Priority: If a pulse attempts to start during the on time or holdoff period of an earlier pulse, the later pulse and its holdoff period are delayed until the end of the earlier holdoff period, similar to Counter Hold, but the counter that triggered the later pulse attempt is allowed to continue running. If two or more pulses try to start at exactly the same time, a fixed priority is implemented (lower number notes first). This mimics the behavior of a prioritized and unnested Interrupt Service Routine on timer compare matches. This is probably? the most common method, and certainly the method used by oneTesla interrupter for two notes (interrupter source available here). For fun and science, I also threw in two "control" methods that are not realistic to implement but are interesting for the purpose of generating comparison sounds. One simply adds pulses together. (Adds, not ORs, so 1 + 1 = 2 instead of 1 | 1 = 1.) My thinking here was that this would be the purest representation of playing two or more notes simultaneously where each note is defined as a short square wave pulse. The other is the fundamental sinusoidal case, which is useful for listening to expected beat frequencies. 1. Same Note: Two channels attempt to play the same note. Simple enough, right?? Loser: Simple Drops. It simply drops all the pulses. Winner: Any of the others, really. None replicate the exact sound of 1+1=2 (twice the amplitude) but they at least play the note more loudly with two channels than with only one. ISR and Counter Hold should be identical in this test case. Random Phase Shift is interesting because it sounds different depending on what random shift is implemented on the first collision. 2. Octave: Two channels attempt to play two notes that are in the exact ratio 2:1. Loser: Simple Drops. It simply drops the higher frequency. Actually, it's dropping the lower frequency and every other note of the higher frequency, leaving half the higher frequency which is the lower frequency. It's effed, is what I'm saying. Winner: This one is tough to call. I think all three other methods produce both frequencies but favor the lower of frequency note more compared to 1+1=2. Random Phase Shift again varies in sound depending on the first random shift. Once it's shifted the f and 2f pulses out of a conflicting phase, they stay where they are after that. Sometimes this sounds more like the 1+1=2 sound than the other two methods. Other times, it sounds like it's creating entirely new, even higher frequencies. 3. Half Tone: Two channels attempt to play a notes that are one half-tone apart. This should illustrate the a worst-case scenario for beat frequency effects. Winner: ISR Priority or Random Phase. Simple drops works but has obvious clicks where there are drops. ISR Priority has a more pronounced beat frequency (like Pure Sine), Random Phase disguises it with noise. At high frequencies, Random Phase sounds worse (lots of random shifts leads to a very noisy sound), but at lower frequencies it might be the winner. 4. Perfect Fifth: Two notes seven half-tones apart. Very close to 3:2 ratio. Other than the octave test, this is a worst-case scenario for a small integer relationship between notes. This is the case illustrated in the sample waveforms above. Loser: Simple Drops. It should be obvious from the above waveforms that this won't work. It creates all kinds of mess, dropping almost every other low frequency pulse and every third low-frequency pulse. I don't know why it sounds the way it does, but it doesn't match 1+1=2 well at all. Winner: Counter Hold or Random Phase. Both are able to shift the 3:2 periods into non-colliding phase for the duration of the 1-second test notes. ISR Priorirty still suffers from collisions, although the distortion they create is not nearly as bad as Simple Drops. 5. Three-Note Chord: A worst-case duty cycle test, attempting to play three relatively high frequency notes at the same time. Loser: Everything except ISR Priority. Simple Drops has ... a lot of drops, which sound like clicks. And everywhere where there would be a drop, Random Phase instead inserts a phase shift that, cumulatively, make it sound extremely noisy. And Counter Hold fails for similar reasons to Test Case 3, I think. Winner: ISR Priority. It's not perfect, but for 10% overall duty cycle, it is pretty damn good. These are certainly not all the possible test cases, and in fact each one could be tested with a wide range of note frequencies, pulse lengths, and holdoff periods, with possibly different results for different permutations. However I've now got a good feel for the strengths and weaknesses of the methods. ISR Priority seems to be the most robust (it wasn't a "Loser" in any test and was only not the Winner in the Perfect Fifth test case. It's proven, easy to implement, extensible to more than two notes, and ideal for a coil with a relatively low resonant frequency and long pulse lengths, where note-playing duty cycles are likely to be high (like mine). However, there is something to be said for Random Phase Shift. With extremely low overall duty cycles, it might be the better choice. It can shift octaves, same notes, and 3:2 perfect fifths (and possibly other ratios) into non-colliding phases, making them more independent-sounding and disguising beat frequencies better. Its noisy sound quality at higher duty cycles outweighs these benefits overall, but it was certainly worth the exploration. 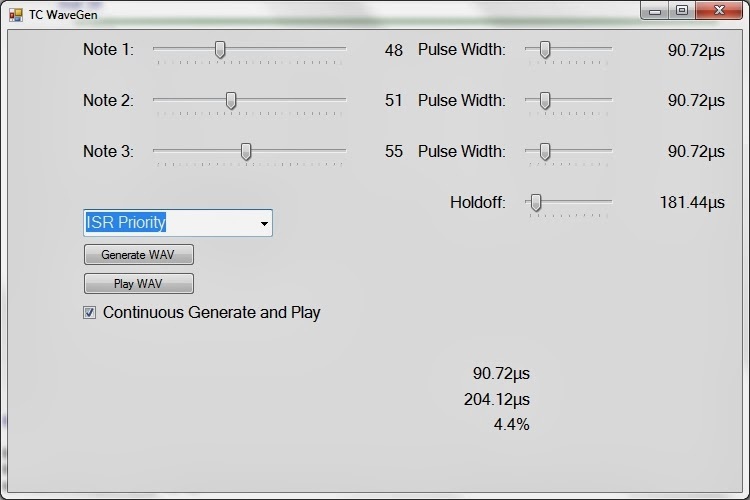 I also think that, if the real-time constraint is lifted (the pulses needn't be ORed in real time by a microcontroller using some kind of simple timer-based algorithm), it is possible to devise even more interesting methods that satisfy the holdoff constraint but produce a better match to the 1+1=2 sounds. I don't know exactly what these methods are, but there is a path of optimization to go down for sure. For now, though, I'm eager to a) implement this on actual hardware and b) test it in conjunction with a MIDI parser on actual MIDI tracks. Not sure in which order. Stay tuned.